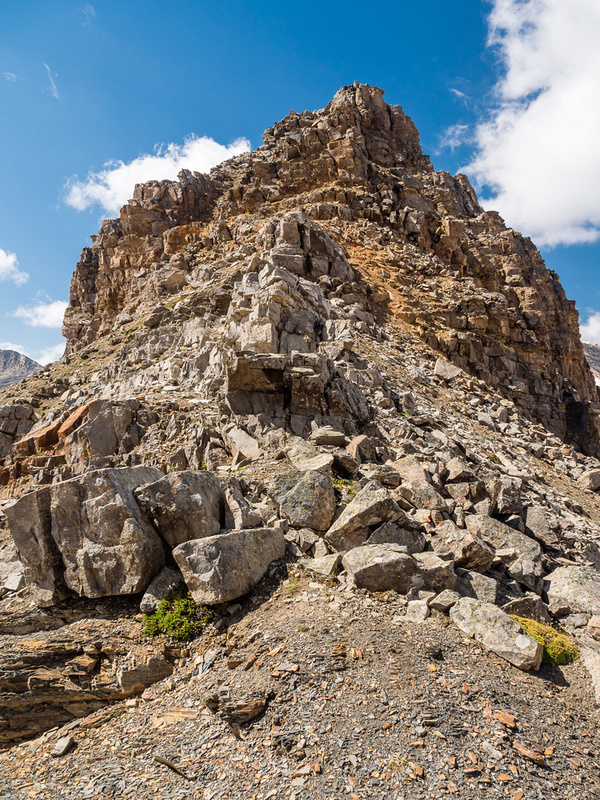 Difficulty Notes: Easy hiking and scrambling to the summit block, moderate steps to the exposed summit. After completing an 11 day canoe trip in the NW wilderness of Ontario, I was ready for a good dosage of Rockies scenery again on Monday, August 13 2018. There was a huge issue with this plan though. Wildfires in British Columbia, one province to the west, were once again conspiring to ruin lungs and views throughout the Rockies. 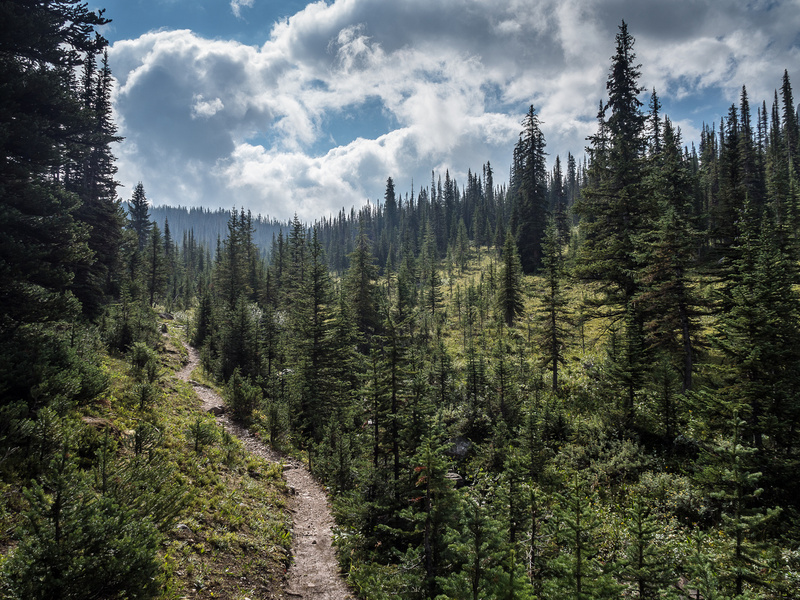 My Facebook and IG feeds were full of nothing but gray smokey “views” and complaints of the ruinous apocalyptic phenomenon that is apparently becoming the new “normal” in August and September for outdoor enthusiasts in Alberta and BC. Phil and I had similar doomsday conditions threatening our previous trip over North Molar Pass on our ascents of Cataract and Molarstone Peak, but we got pretty lucky with the views on that trip. Could I count on lady luck again in this beautiful area of Banff National Park, tucked away behind the busy hwy 93 corridor to Jasper? Apparently – YES, I could! I somehow convinced Hanneke to join me at least to North Molar Pass and we set out on a cloudy, misty morning from the Mosquito Creek parking lot, following another group of 3 hikers. The long jaunt up Mosquito Creek to the campground was made lovelier than usual with cool temperatures and a moody atmosphere. If I’m honest about it, I’m getting a bit bored with the 5.5km stretch to the campground, but chatting with Hann and it being her first time helped with the drudgery that is a flat, rooted, muddy trail along the creek. Yes, it was very muddy. We found out later, from a group of backpackers returning from Fish Lakes that the weekend was basically one big thunderstorm, so that explained the higher-than-normal creek flows and mucky conditions we had in the morning. 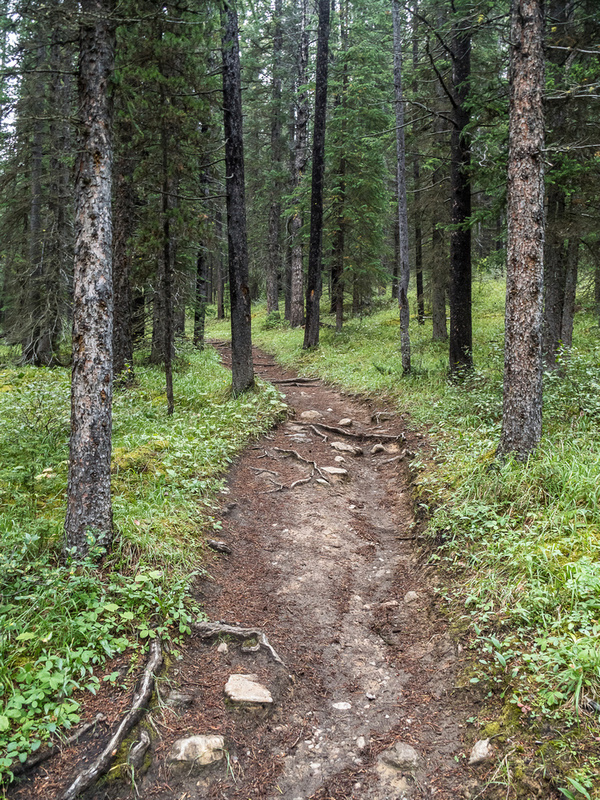 After the campground the trail started its usual ascent to treeline, first gently and then more steep until all of a sudden we popped into the meadows and Hann’s jaw started to hit the ground as the scenery really opened up. Despite being up here recently, the views are never old in this alpine Heaven. 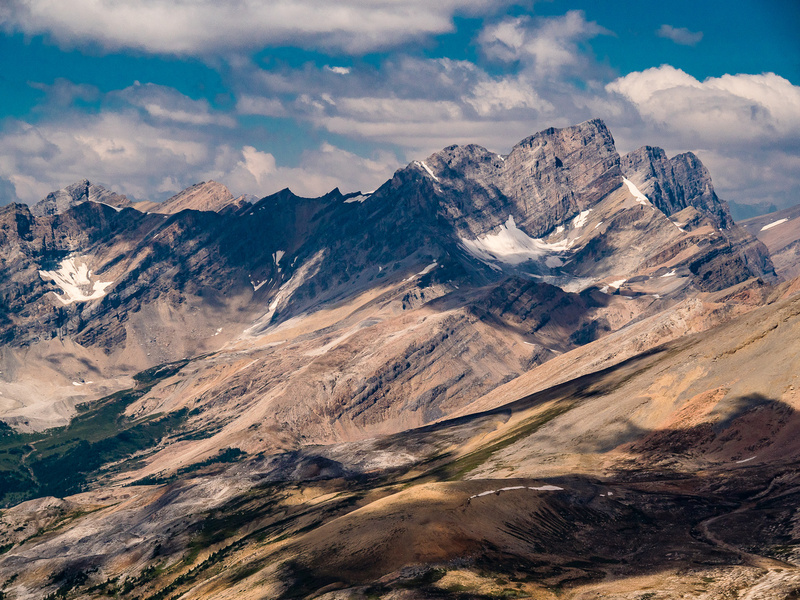 The towering east cliffs of Noseeum Mountain were showing off as usual, with clouds adding to their brooding presence over the dying flowers and green grasses in the acres and acres of alpine goodness that exists around the North and South Molar Passes. We started running into groups of backpackers returning from Fish Lakes – all with stories of a very stormy weekend. They were all delighted with the non-smokey views though! 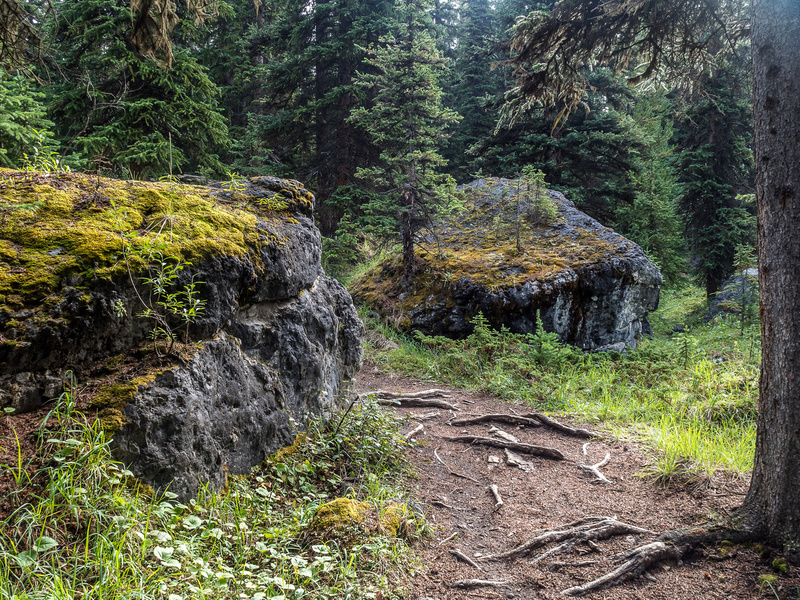 Some LOTR scenery on the trail near the Mosquito Creek campground. The Fang looks pretty darn cool from the Molar Meadows. 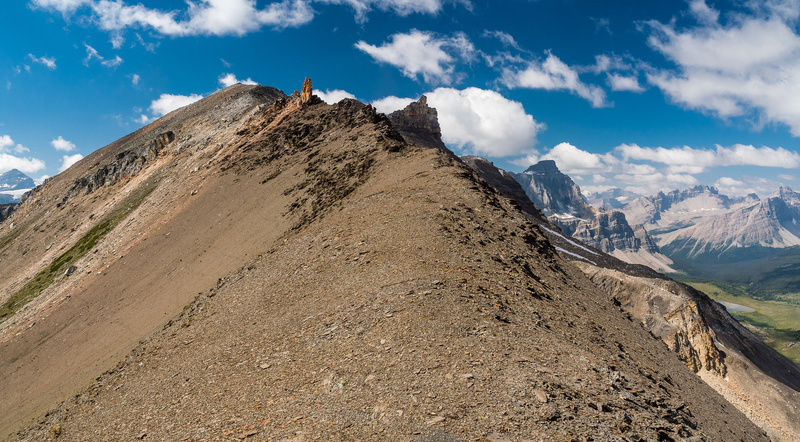 We hiked easily past the unnamed lake north of The Fang, the peak looking very impressive from this angle. 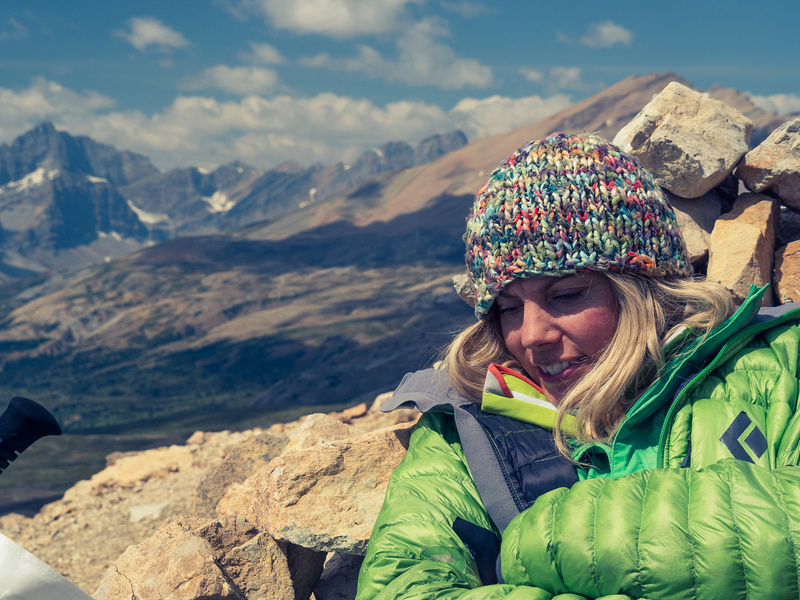 As we approached North Molar Pass, Hann became less and less interested in doing the scrambling and decided she’d be happier taking a nap at the pass. I could learn a thing or two from her, I’m thinking. The scenery from the pass was really opening up and the best part was the lack of smoke. It looked like I was going to once again get lucky with views in this area! 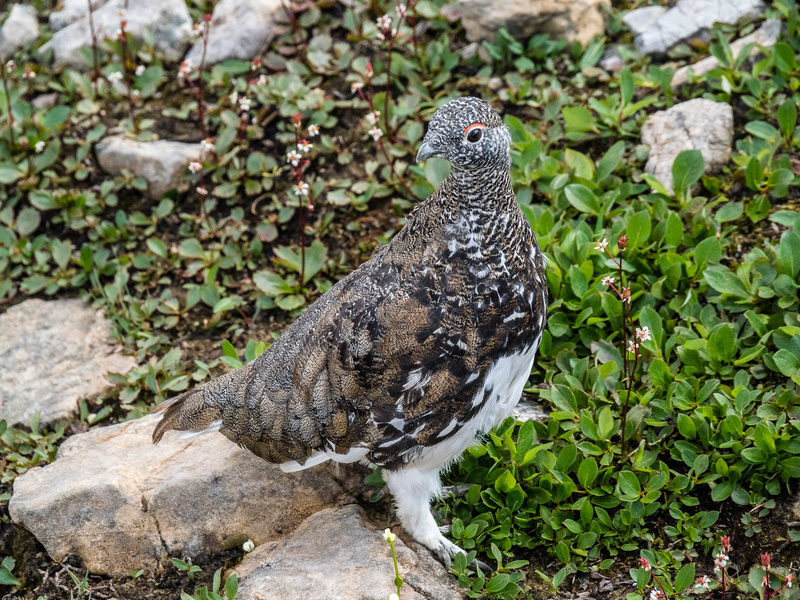 It was nice to chat with the group of three that we’d been trading leads with to the pass. They were going up Molarstone Peak and wondered where the heck I was going. I pointed the opposite way and mentioned, “somewhere up there”. They wished me luck and I did the same to them, giving them some advice on the best line to their peak. As Hann watched with some interest, I tackled the 2nd hardest terrain on The Fang – straight up the nose of the ridge from North Molar Pass. It was easier than it looked – as I suspected it would be. Hann wouldn’t have loved it, but I’m fairly confident she would have survived it. At this point we didn’t realize that the terrain off the SW end of the ridge was pretty tame to South Molar Pass, or I likely would have encouraged her to try the ascent at least to the false summit. 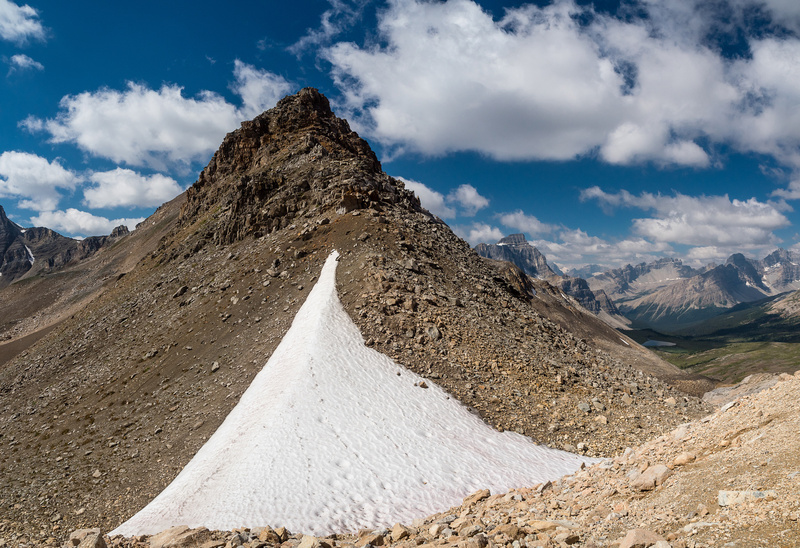 We could have avoided descended the easy/moderate scrambling on the nose of the ridge by descending via South Molar Pass and doing a nice loop – which is what I recommend for this venture. To be fair, Hann doesn’t like scrambling and I don’t like pushing people past where they’re having fun. What’s the point of heading out with people if they’re going to be nervous and apprehensive the whole time? It’s taking me a few years, but I’m learning that not everyone enjoys the same things… After the blocky (loose) terrain on the nose of the ridge was complete, I found myself looking ahead to a very pleasant ridge walk to the false summit of The Fang, including the brilliantly colored and surprisingly huge pinnacles that Nugara mentions in his guidebook. Nothing after the nose was more than easy scrambling / hiking until the summit block. From the false summit on the ridge the views were more than satisfactory already. I would strongly urge hikers to try to make it up here, even if they don’t summit The Fang. 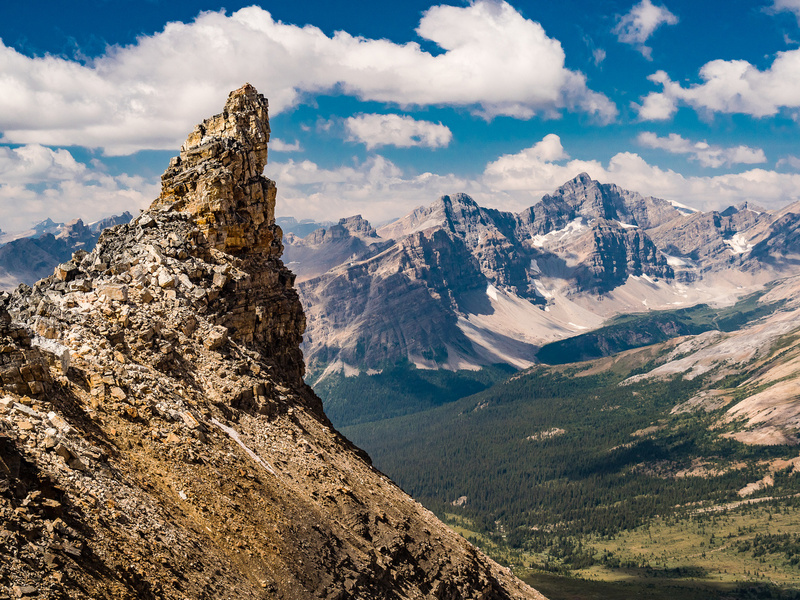 I have to agree with Andrew that between Molarstone and The Fang, this ridge has some of the best views in the Rockies – it’s really that good! 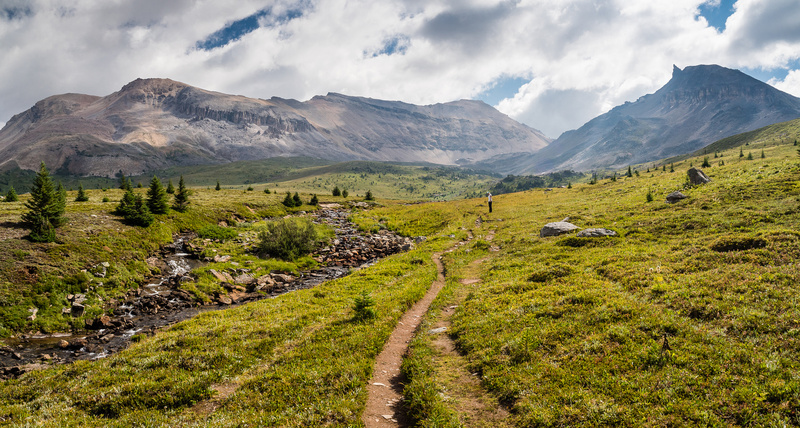 Granted, it’s a bit of a trudge to get in here, but pretty anyone can handle the gentle elevation gains on the long approach trail if they’ve hiked in the Rockies before. The scenery will keep you going even if your heart wants to flop out of your chest every once in a while. 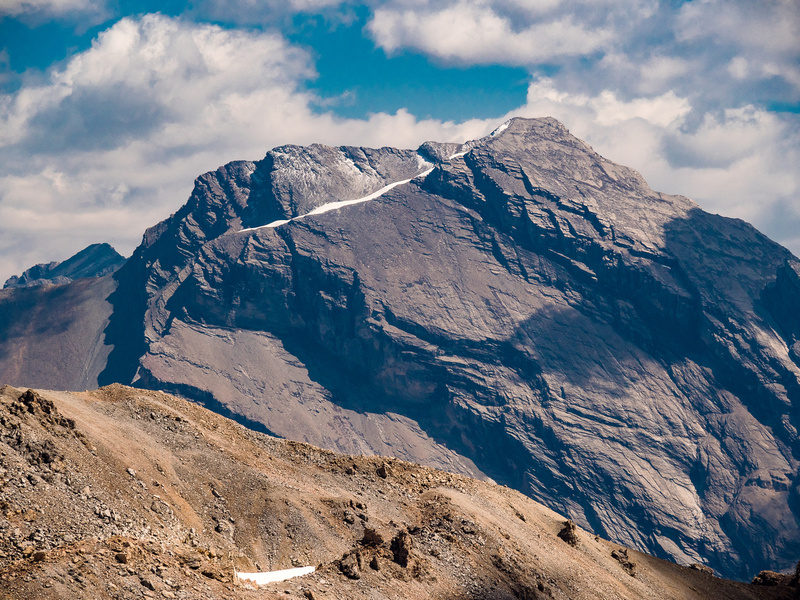 Looking ahead to the delightful ridge scramble. Looking back at the pinnacles and the approach ridge with Molarstone looming beyond. Cataract Peak, Fish Lakes and Minnow Peak at right. I balance my way cautiously towards the summit block on huge, shifting boulders. 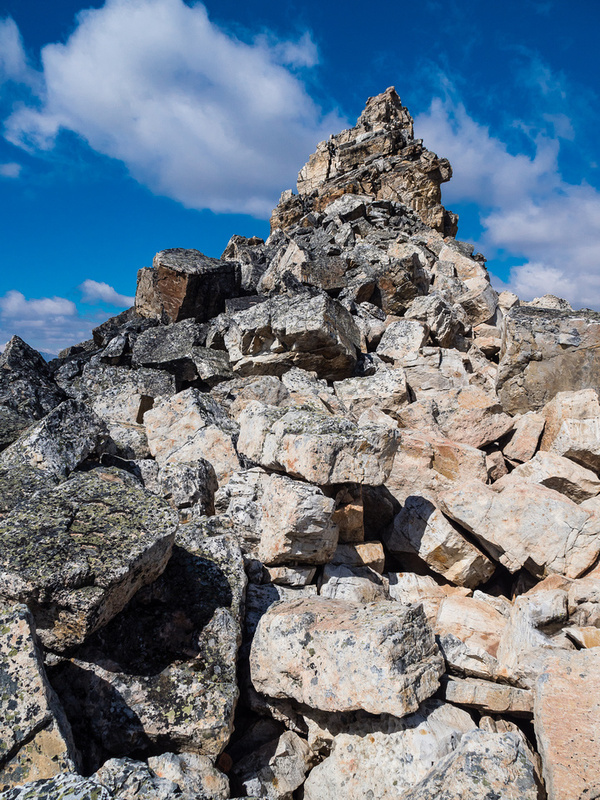 The west aspect of the summit block offers the easiest and safest terrain – but note the huge, loose boulders still balanced here. Despite the great views, I wasn’t quite done yet. I was trying to rush a bit, not wanting to leave Hann too long at the pass and the next section slowed me down far more than I wanted. Nugara mentions some care is needed on the white boulders to the summit block, and he’s spot on. These boulders are fun enough (if dry), but they are extremely dangerous. This particular boulder field was more solid than others I’ve been through, but I urge caution when skipping across these giant, heavy beasts. Eventually I was through the boulders and staring up at a pretty steep summit block. I tried tackling the steep blocky south wall, but backed off when I had to fully weight a few boulders that looked a bit unattached for that kind of attention. Nugara mentions the “west” side, so I downclimbed a bit and traversed that way to try my luck. This worked well and other than a few moderate moves, was pretty quick and easy. The summit of The Fang is appropriately tiny and VERY exposed! More caution is required here, especially as you stand and take in the incredible panoramic view it offers. Incredible views over our approach meadows to the north (L) and east (C, R) with Noseeum, Oxo, Watermelon, Mosquito, Willingdon, Molarstone, Cararact and Minnow (L to R) among many other peaks visible. Looking north over the molar Meadows with South Molar Pass at left. 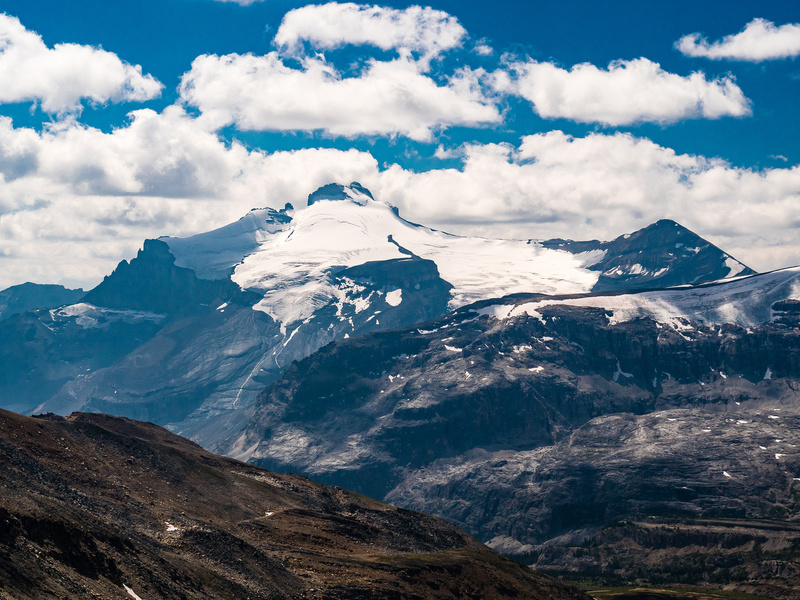 The views past The Fang and over the Molar Meadows are worth making the false summit on the ridge. My exit down to NMP at far right here. 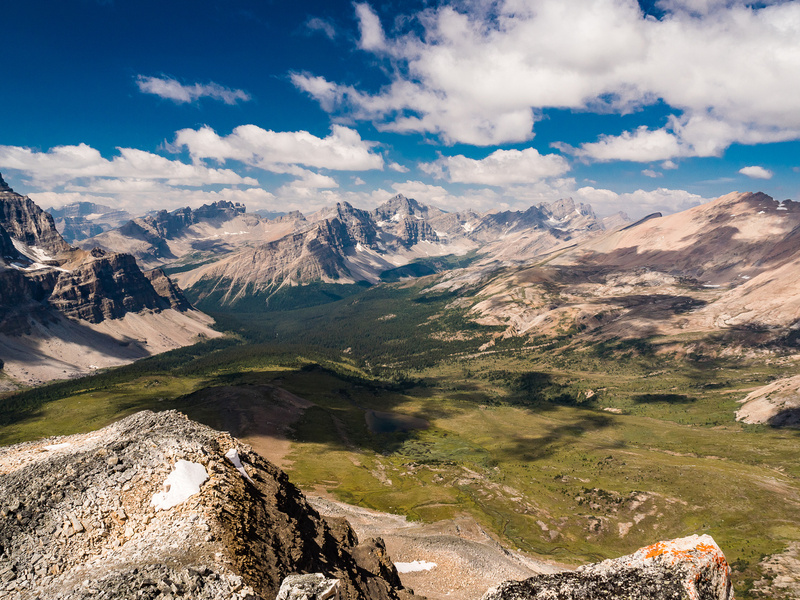 Pretty sweet views over the Fish Lakes includes Cataract Peak, Mount McConnell and Mount Drummond all looming over the Pipestone River Valley. After snapping my summit photos I carefully downclimbed the summit block and started back. I tried skirting the annoying boulder field to speed up my return to North Molar Pass where Hann was waiting, but I probably ended up taking more time instead! Oh well. The descent back to the pass went easily and quickly and within about an hour of leaving, I was back at a VERY comfortable looking Hann who’d apparently even managed a 30 minute nap in my absence. I regaled her with tales of the grand views she’d ‘missed’, but she very practically replied that I’d missed a pretty darn sweet nap in warm sunshine with a cool breeze myself, so we were likely even. She had a point, I was hot and tired and she looked pretty fresh. The egress back through the meadows was extremely pleasant in 15 degrees and sunshine. The rooted and rutted return along Mosquito Creek was surprisingly busy in mid afternoon, but we chatted and set a good pace. It took less effort than I expected and we were back at the car. 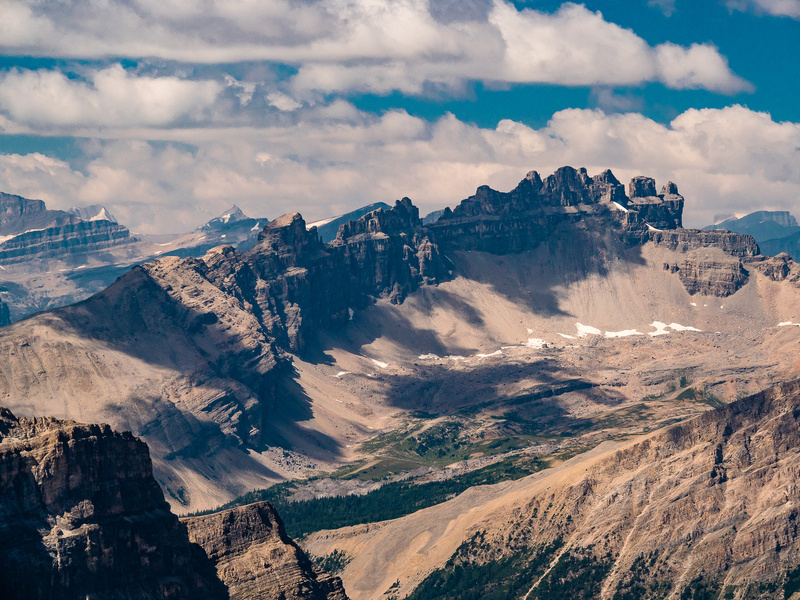 I can’t recommend both Molarstone and The Fang enough for folks who can handle the ~1300m of height gain and likely around 30km of hiking if you combine the two summits and both North and South Molar Pass. 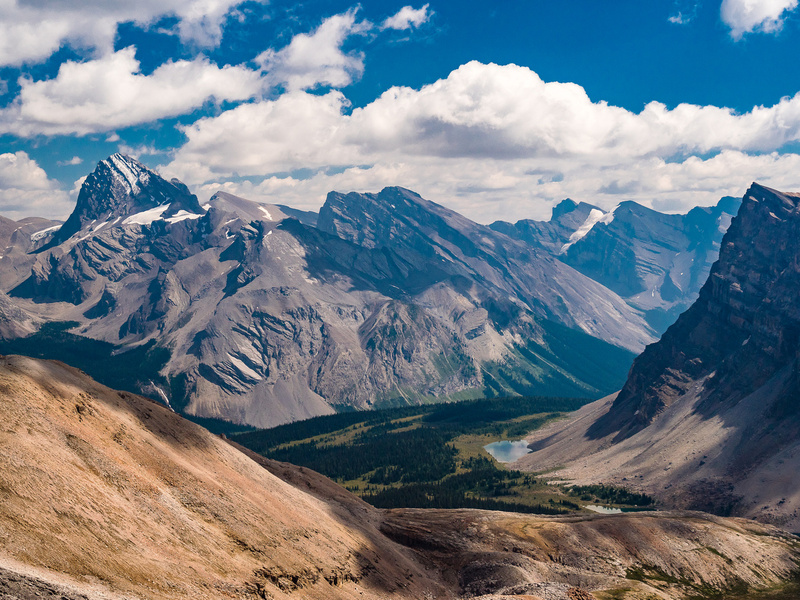 This would be an absolutely stunning hike / easy scramble that would definitely overheat your camera at several points throughout the day, assuming you choose a nice clear, calm day to tackle it. The Mosquito Creek trail is wide and well used but it's pleasurable enough on a cool summer morning. Although the flowers were mostly past their prime (i.e. dead), the scenery to the Molar Meadows is never disappointing. 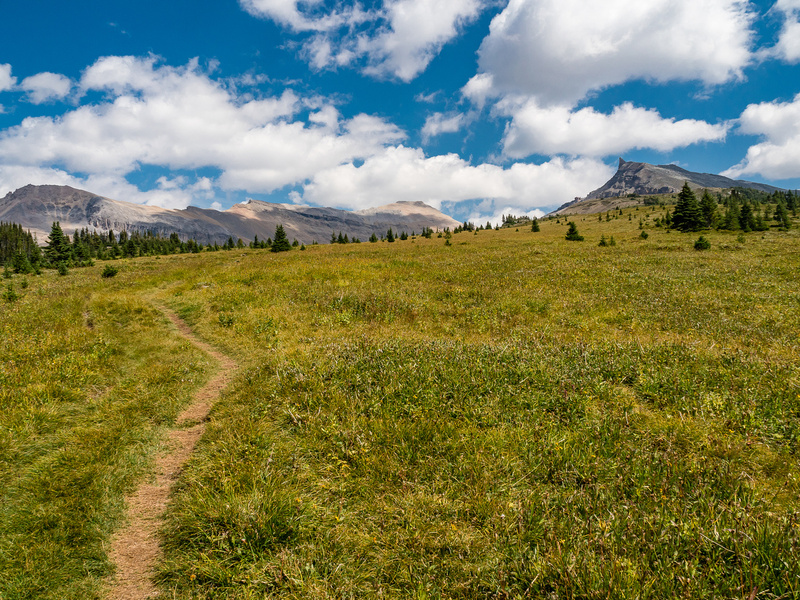 This hike will leave you satisfied pretty much no matter what the conditions - it's one of my favorite alpine meadow hikes in the Rockies. The unnamed lake in the meadows isn't as pretty as some others along the parkway, but the ambiance is hard to beat. The moonscape just beneath North Molar Pass. Looking along the ridge to the summit of The Fang as we approach NMP. As you can see - it's pretty straightforward. A Billy Goat near the pass. Spot Hann (green coat) and the other three scramblers heading up Molarstone behind me as I scramble the nose of the ridge towards The Fang. Looking up the nose of the ridge - easy / moderate scrambling - and fun. 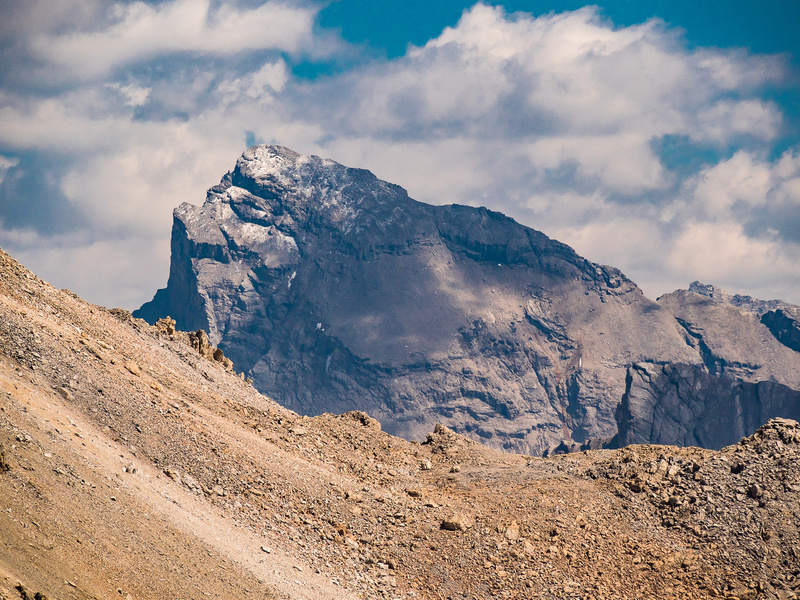 Looking ahead to the delightful ridge scramble. The pinnacle visible at center with The Fang obvious to its right. 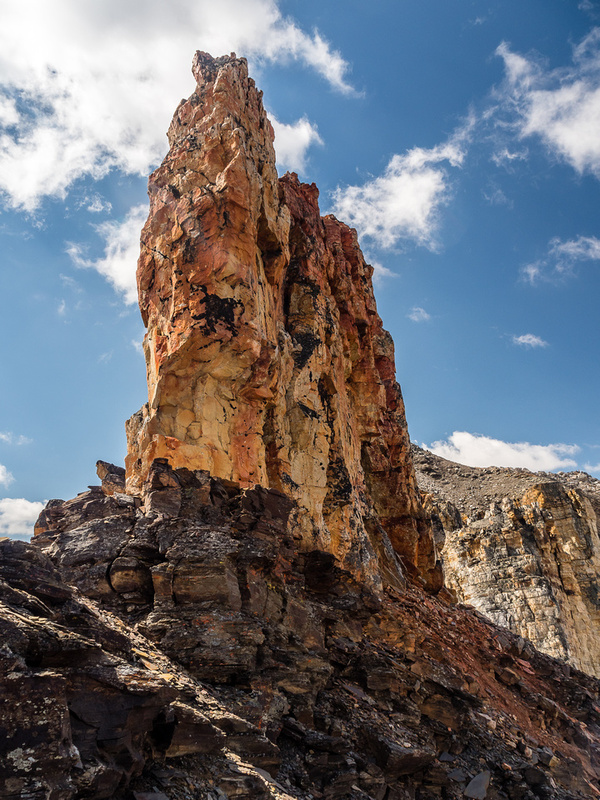 It's hard to get a sense of scale without a person in the shot - it's at least 50 feet tall. Looking back at the pinnacles and the approach ridge with Molarstone looming beyond. Cataract Peak, Fish Lakes and Minnow Peak at right now. The Fang still looks impressive looming over the Molar Meadows and our approach. The west aspect of the summit block offers the easiest and safest terrain - but note the huge, loose boulders still balanced here. Noseeum, Oxo, Watermelon, Mosquito, Willingdon, Molarstone, Cararact and Minnow (L to R) among many other peaks visible. 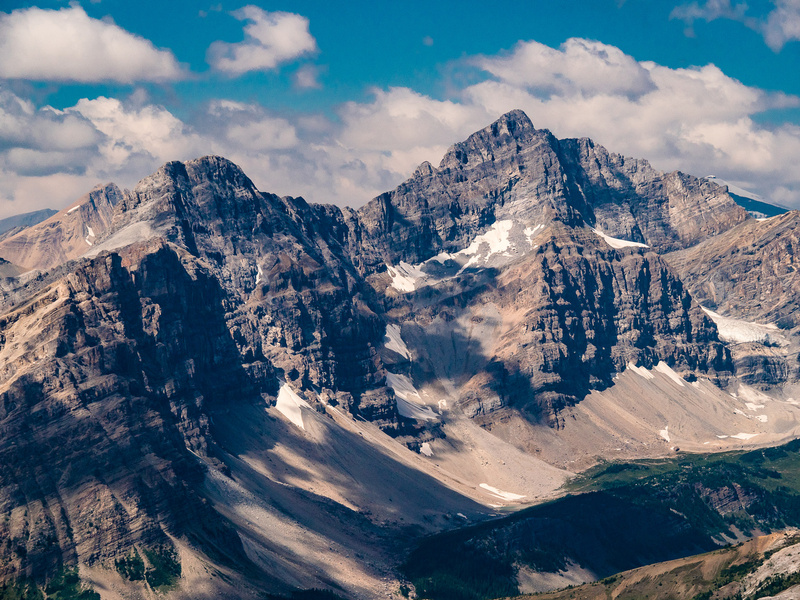 Cataract Peak is a well hidden Rockies giant that is just under the magical mark of 11,000 feet at 10,936. Mount McConnell lies to the SE of Cataract Peak. 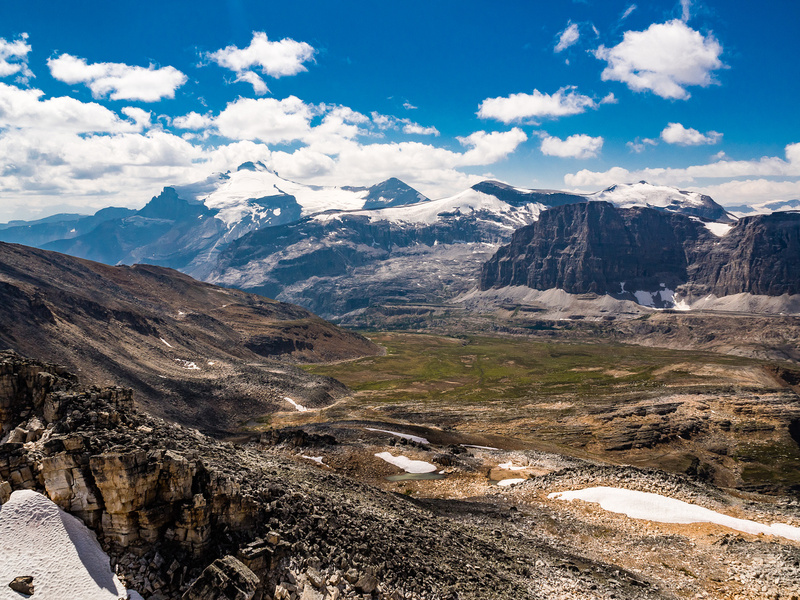 Incredible views south (L), west (C) and north (R) over South Molar Pass includes Molar, Hector, Little Hector, Andromache, Noseeum, Oxo, Watermelon and Mosquito (L to R). 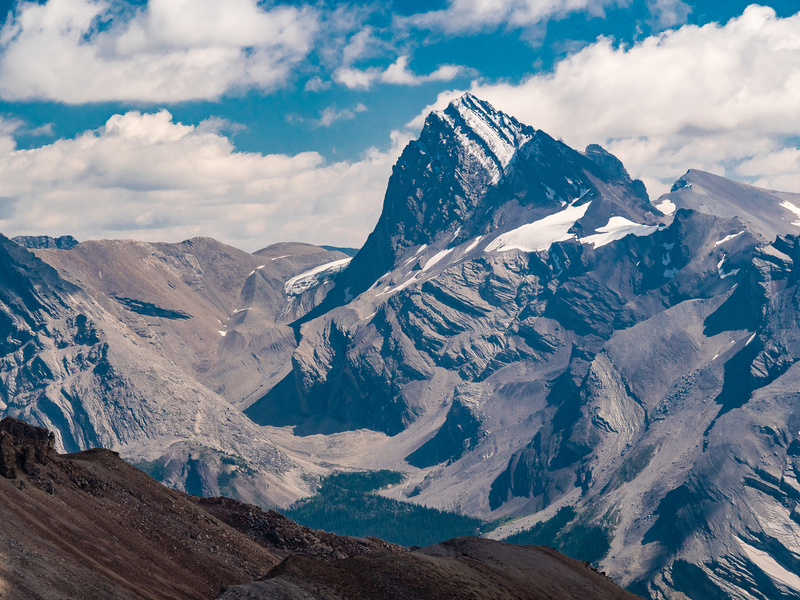 Mount Hector is one of the most popular 11,000ers to ski - for good reason. Looking over our approach towards Watermelon and OXO. 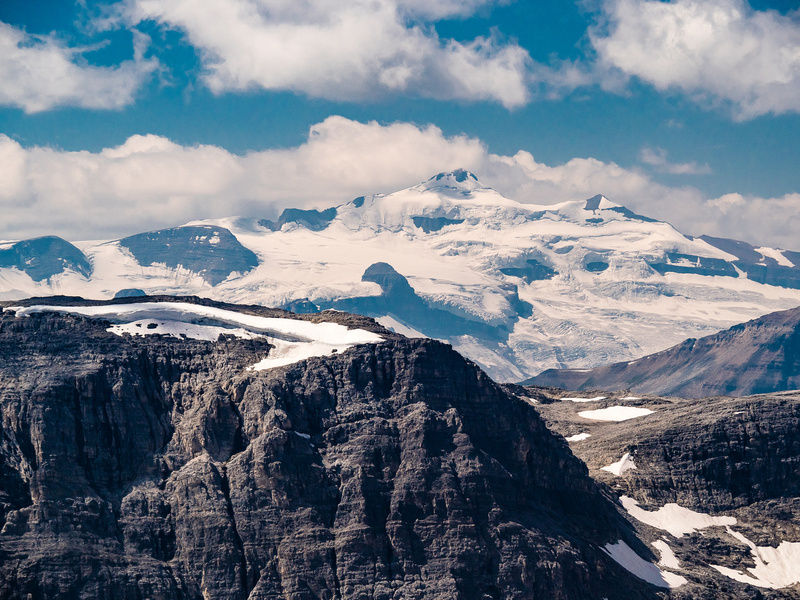 The highest peak on the Wapta Icefield - Mount Balfour lies across hwy 93 to the west. Dolomite Peak - a scramble I did after work with Sonny Bou way back in 2004. Wietse and I were only around the 8th party to sign the summit register on OXO Peak in early September 2017 - I still think this is a dangerously loose mountain. Watermelon Peak is another beauty in this area. Phil and I scrambled this peak in 2017 in a double header day trip with Bobac Mountain. 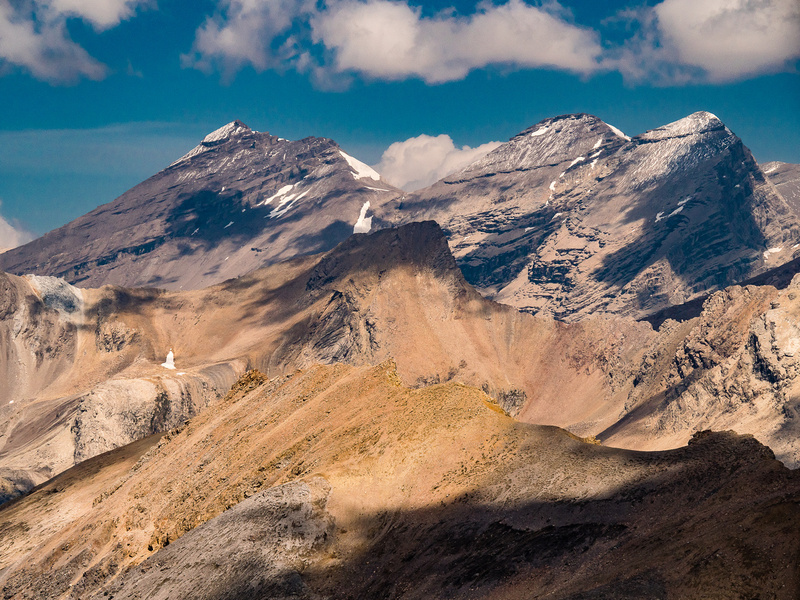 Mount Willingdon (L) and Crown Peak (C) are 11,000ers. Tower Peak at right, is a near-11,000er. I did all three peaks in one day from Devon Lakes back in August, 2013. "Little" Cataract isn't that "little" at over 3100 meters high. The descent to South Molar Pass doesn't look too hard. One reason to make the ridge is this view over the Fish Lakes and its gorgeous alpine meadow approach from NMP which is at left here. You can see why good balance is needed for the summit of The Fang! OXO at distant right here. Hann wakens from her deep slumber, comfortable at North Molar Pass! A last glance back towards The Fang as we exit the Molar Meadows.